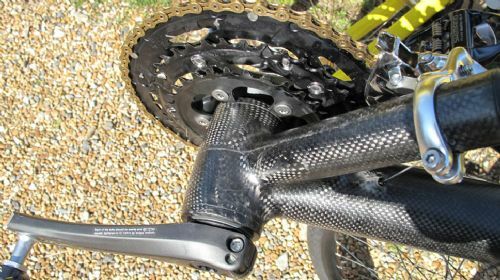 Alternatively, there's the HPVelotechnik / Toxy style chainring guard: It's attached by a thin piece of metal that clamps between the bottom bracket and its shell, so ought to fit just about anything? When finding one for my Baron, I tried borrowing the ICE version from my partner's trike, but there wasn't enough BB shell for it to clamp to, on account of the large-diameter boom. The HPVelotechnic one worked fine. Thanks Kim. It looks good but I can't see how it would fit? Will it fit a triple? There is no scale to the photo so I can't see if it is big enough. I did ask Stuart for an HP Velotechnic one but the one he was trying to fit did not look anything like that one. i've used an older version, which appears identical except it has three arms instead of two, on various triples without a problem. The screwing the bottom bracket to hold it could be a problem. Stuart says they have never seen a bottom bracket like mine before. He said it pushes into place? I'll go and photograph it after lunch and see if I can see what he means. Could you carve up a sheet of Al and mount it off the inside of your granny ring with longer bolts and spacers? The granny ring rotates though so it can't go over the big ring without fouling? Or am I misunderstanding? It can rotate with the big ring but there is not room to fit it in because the crank is so close to it. Thanks Dave. There seems to be sod all to mount a conventional guard to. Looks like it may have to be a custom job. 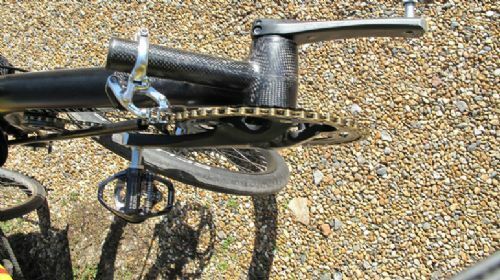 The ICE Trikes Chain Ring Guard has a two part clamp so it might be possible to pack it out or file it to fit the Fujin? Go to this link on ICE's web site then click on the "DOWNLOADS" tab for the instruction sheet with diagrams of the mount. 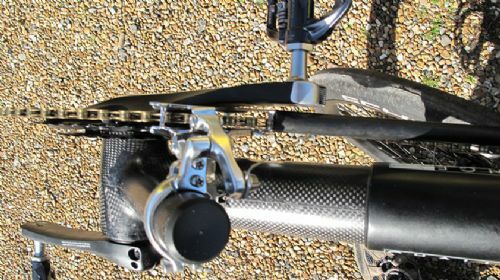 Thanks Steve, but I've measured my ICE trike BB and the Fugin BB and the Fugin starts off bigger and then adds more because of the thickness of the carbon fiber housing as opposed to the aluminium? boom housing of the trike, meaning the Fugin ends up with about a18 mm greater diameter. Looking at the ICE drawing there is nowhere near enough meat on the clamp to cope with that amount of filing. Also to be more awkward if you look at the photo, the curve and the fact the small ring overlaps the BB housing means there is no flat area that side. If it was big enough I could have mounted it on the other side and made an extension across the chain rings.